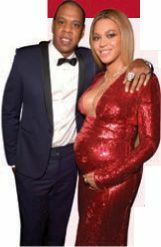 ▪ Beyoncé and Jay Z last week welcomed twins—reportedly a boy and a girl—at UCLA Medical Center in Los Angeles. “Bey and Jay are thrilled and have started sharing the news with their family and closest friends,” a source tells People.com. It was actually Beyonrdent fan base— “At long last, the royal babies have been born!” read one tweet. Beyoncé and Jay Z also have a 5-year-old daughter, Blue Ivy.